The waterproof shoes are created to protect the shoes and feet from getting wet so that one can walk without any issue on rainy days. They are also designed to be used in the hiking, as the ground can be wet regardless of the actual rain from the sky. However, despite the invention of effective waterproof shoes, feet can still get wet for many reasons, such as water entering through the socks or the hole where one sticks in the foot. Ironically, one of the greatest factors is not the moisture from the outside, but the sweat from the feet. As more effective the waterproof material becomes, the more sweat it would not allow to pass through. To deal with this issue, I tried to re-design this product to improve its ventilation. 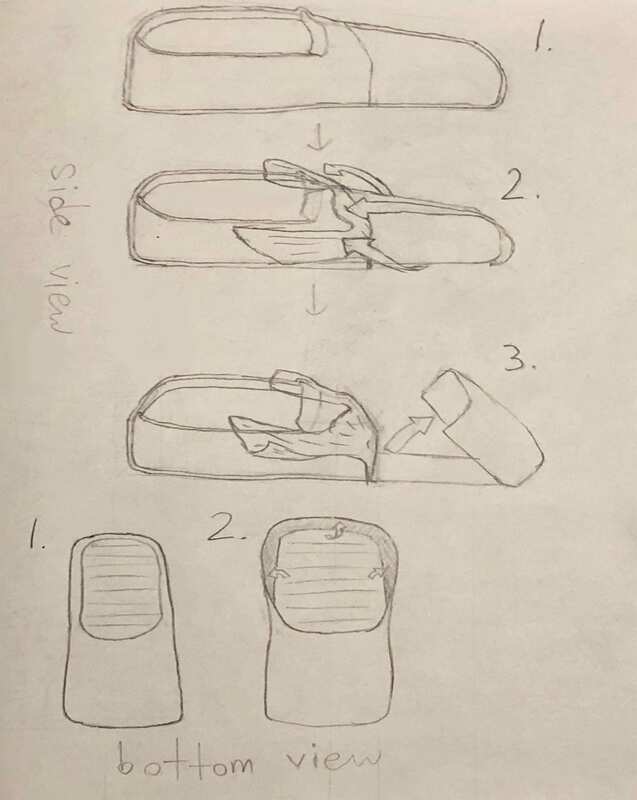 In my new design, the part that covers the toes and the upper region of the feet can be detached and opened like an envelope. It can be reattached back firmly to maintain its shape. 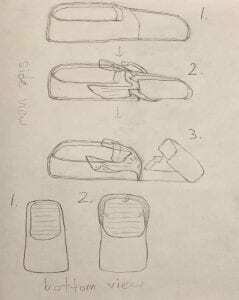 This design would allow the front part of the shoes, where the greatest amount of perspiration occurs, to be accessible for cleaning and drying. For the regular shoes, due to their characteristic shapes, it tends to be difficult to reach or see all the way to effectively remove the things inside. Especially for moisture, one cannot easily apply enough pressure to absorb it with tissues or newspapers. Nevertheless, if one can open up the inner part of the shoes, the user would be able to view and treat it appropriately. Due to this opening function, it may become difficult to be completely waterproof even with GORE-TEX, as some water can get into the shoes thorough the gap between the connecting part. To reassure the protection, I decided to add a thin, transparent, yet elastic layer of silicone around the shoes, except for the small region at the bottom front. Normally, this layer would be tightly attached to protect shoes from water (for the side near the ankle, it is completely sealed and cannot be removed). However, when the inside becomes wet due to sweat or water, one can strip off a upper portion of the layer through the uncovered area at the bottom front, which then enables the opening of the front part of the shoes mentioned earlier. The layer is expected to be flexible enough to be flipped, rolled, and return to the original shape. With the layer, the shoes can still be waterproof while allowing more ventilation. All shoes belong to the footwear system, and my product would impact the system by improving the effectiveness of the shoes. 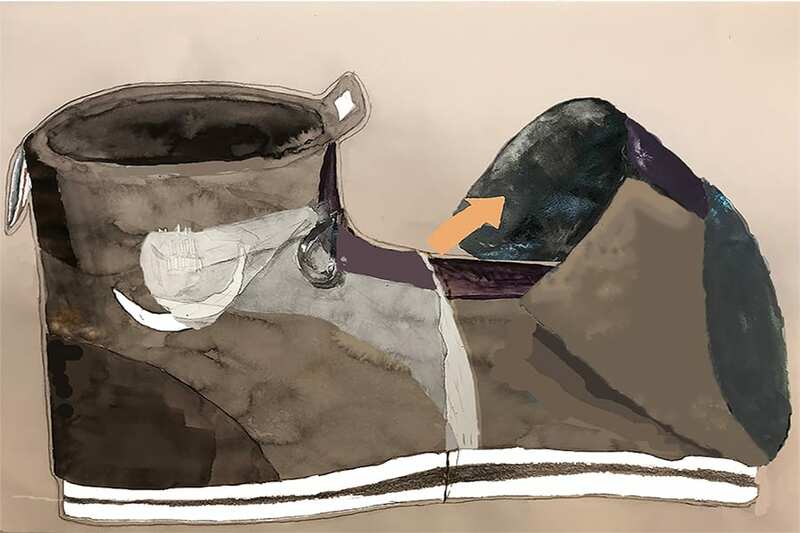 With this design, it would become much easier to dry the shoes after the inside gets wet, which permits them to be reused within a short period of time for more outdoor activities. Furthermore, since the inside of the shoes can be exposed to the air, it would greatly reduce the unpleasant odor that wet shoes could cause. Considering how people tend to be insensitive towards their own smell, minimizing the source of smell would also benefit the people near the owners of the shoes who are more concerned with the smell. The extra silicone layer, in addition to the GORE-TEX surface of the shoes, would minimize the chance of water leaking in from the outside. As a result, the inner surface of the shoes, where the feet contact, can prioritize the comfort over protection, maintaining the pleasant experience for the long-term use.